The wind sensor enables raising of the blinds depending on the strength of the wind, for example. In this way, sensitive blind slats can be protected from increasing wind. 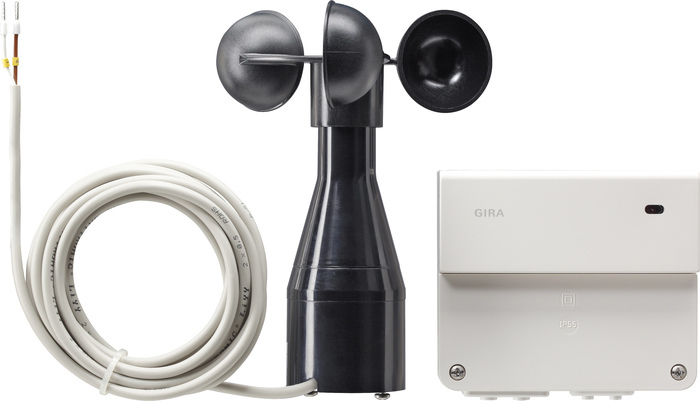 The wind transmitter is used to convert the wind speed into electrical signals. It is mounted on the roof or on the side of the building and connected to the evaluation unit. Test mode with test LED. Distributor terminals for connecting a heated wind signaller. Mounting bracket included in the scope of supply.